Editor’s Note: NLU Contributor Kevin Jackson is a Sophomore on the Georgetown golf team majoring in Economics and minoring in Journalism. The piece below was written for his fall semester journalism class, and he received an A.
Thomas Pieters is standing in the 11th fairway of Royal Troon Golf Club. It’s the final round of the 2016 Open Championship, and by this point, Pieters is well out of contention to win the tournament. So as he stands up to his seventh (yes, seventh) shot on the long par four 11th hole, still miles away from the green, he’s just about reached his breaking point. He gives the ball a whack, and seconds later has successfully impaled the nearest gorse bush with two halves of a former golf club, snapped over his knee in fury. And in the ultimate display of irony, the ball rolls onto the green. In fact, the NBC commentator describes it as the best approach shot of the day at the 11th hole. Fifteen seconds of airtime on the NBC broadcast, and that was the last anyone heard of the intriguingly ironic episode. Anyone, that is, who hasn’t met the fine gentlemen of No Laying Up. Three friends had a group text; it dated back to their college years at Miami University (Ohio), and these guys loved talking sports. Chris “Soly” Solomon, one of the group members, explained how he and his friends had long discussed starting some kind of sports blog. “Some of the stuff these guys came up with, the running jokes, they were too good to keep private,” said the 30-year-old Soly. Though not necessarily golf specialists, they decided that their proposed blog would focus on golf. In late 2013, Soly and his two friends, Phil “Big Randy” Landes and Todd “Tron Carter” Schuster, opened a Twitter account under the name “No Laying Up.” In search of technical help, they enlisted Todd’s younger brother Neil, the group’s resident San-Fran techie, to help them develop the blogsite that launched on January 1, 2014. Just shy of three years later, four guys and a group text has transformed into a brand with 66,000 followers on Twitter and tens of thousands of weekly page views on their blog. They cover events around the country. They have interviewed the best players in the world. But they all have full-time jobs outside of golf. They live in three vastly different time zones. And they have only been together in person once. What the hell are these guys up to? The short answer, as “Young Neil” Schuster, 27, would say, is that they provide “hot takes” on the world of golf. Thomas Pieters’ club enjoys its last moments in one piece. Golf isn’t exactly a sport gushing with humor. A sport dominated by rich white dudes, wearing collared shirts and tailored slacks, reacting (supposedly) like first-class gentlemen to whatever the competition throws their way? Thrilling. No Laying Up doesn’t quite take that view of the game. 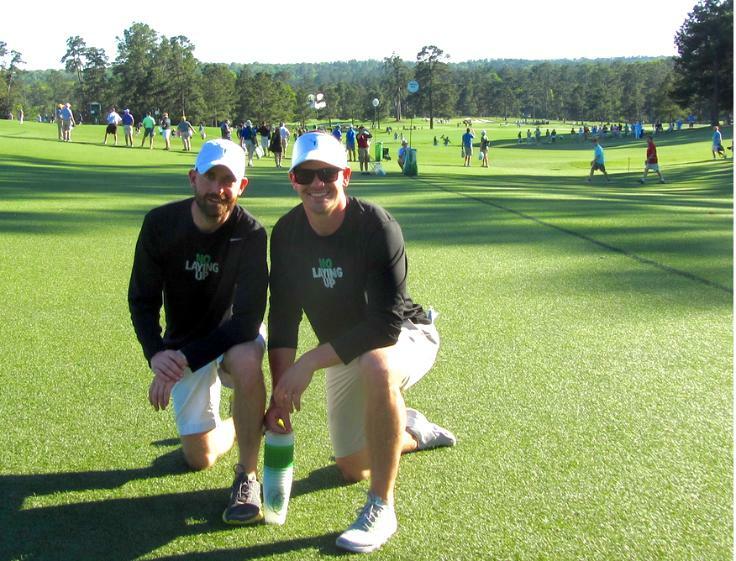 Look no further than #TourSauce, a 2014 invention by the NLU crew that has since found massive appeal on Twitter. The concept, brilliantly simple, is that certain actions on the golf course can only be performed by PGA Tour players without said action looking completely ridiculous. Tiger Woods, for example, is known to twirl his club with a definitive flourish after hitting a good shot. But if a 20-handicapper playing on Sunday morning with his buddies tried that move? He’d be laughed off the course. Back for a moment to our club-snapping friend, Thomas Pieters. His temper tantrum in any non-professional golf setting would have been nothing short of absurd, not to mention that the ball ended up in a great position. So when it happened, Twitter exploded with tour-sauciness. A few seemingly obscure seconds on NBC would eventually become the most popular #TourSauce of 2016. 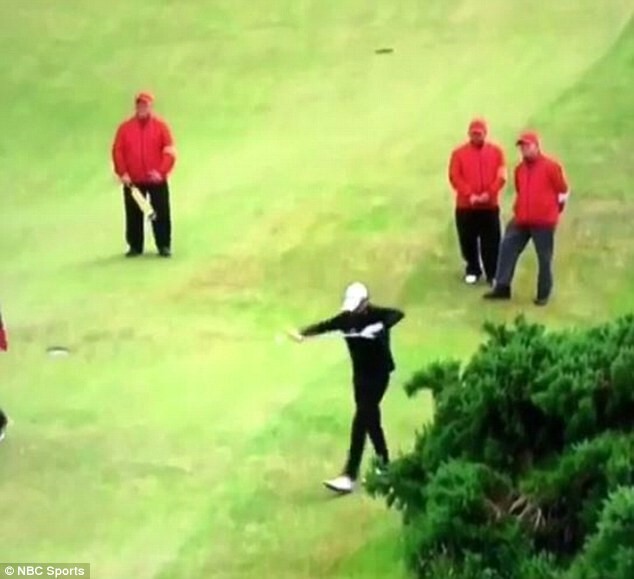 “The greatest #TourSauce in history,” tweeted CBS sportswriter Kyle Porter, posting a video of the club-snap-throw incident. #TourSauce is not by any means the only example of NLU’s sense of humor, but it might be the best one—just simple enough and just brilliant enough that it finds the perfect appeal among fans. But even referring to NLU’s collective “sense of humor” doesn’t quite do them justice. These guys are individuals. “We realized that we all have different opinions about almost everything,” said Soly. This difference in opinion has led to each member of the group using separate Twitter accounts. While the blog provides a common medium for them to promote the NLU brand, the four different Twitters allow the guys some individual freedom and give their fans an extremely diverse perspective. It explains why they never run out of “fresh, funny content”—the guys are amusing in their own styles and enticingly hilarious as a whole. I have plenty of friends who are funny, and plenty of them have Twitter accounts, but none of them have 66,000 followers. Clearly, the four guys at NLU have something besides humor that has enabled their tremendous success over the past three years. The first part of the story lies in the nature of traditional golf media outlets, which are very, well, traditional. “When you’re talking about traditional sports media, it has a tendency to want to describe people as heroes or villains, and usually heroes” said Shane Ryan. Ryan is the author of the New York Times bestseller, Slaying the Tiger: A Year inside the Ropes on the New PGA Tour, a book that offers in-depth profiles of many of golf’s up and coming stars. He feels that his initial unfamiliarity with the golf world gave him a great perspective on golf journalism as a whole when he wrote the book. Soly, Neil, Tron and Randy did not belong, and in many ways still don’t, to this well-established world of golf journalism. At the end of the day, they’re just golf fans. Their approach would have to be different, both in content and delivery. So how do they reach people? It’s true—golf doesn’t keep you glued to the TV screen in the same way as a basketball or football game, which means that the viewer has plenty of time to browse through social media while watching a tournament. It creates a unique second dimension of golf coverage, one that had gone mostly ignored by mainstream golf journalists: a social-media-based conversation among the fans. NLU complements, rather than conflicts with, TV coverage of a tournament. They saw the opening and seized it. Jack Musgrave, 21, an avid reader of NLU and an NCAA Division I golfer, found just what Soly was describing. NLU has provided that source of golf-fan viewpoint that the game needs. Their informal, have-fun-with-it attitude is contagious, and people have responded with emphatic support. Not to say that the size of their following is not important to them, but it would be worse to think that they’re only in it to rack up as many followers as possible. This claim that they aren’t in it for the “page views” is illustrated perfectly by the fact that the blog doesn’t run ads, a decision that gives readers a clean-cut experience. They’ve had offers to change that, according to Neil, but as of now the group’s only source of revenue comes from selling their custom merchandise. “Even now, with a lot of followers, growth isn’t really our goal,” said Soly. “It’s still about reaching out to people who really want to talk golf with us”—something that most of golf media has apparently missed. Part two of NLU’s success story began in the early morning hours of November 27, 2009, when Tiger Woods wrecked his Cadillac Escalade outside his Florida home. I call this the unofficial birthday of the PGA Tour’s next generation, though certainly no one would have known that at the time. But in the seven years since the crash, the world has seen Tiger confess to his affairs with multiple women, deal with a plethora of surgeries on different body parts, rise back to the top of the world rankings after a phenomenal year in 2013, and finally take a back-injury-induced sixteen months off from golf from mid 2015 to December of this year. Tiger has been beaten up. In his place, a new generation of stars has taken control of the sport; five of the top ten players in the world are in their twenties. 23-year-old Daniel Berger, ranked 31st in the world, described the mentality of these new players. Hungry is the right word—these guys are dominating golf and ushering in a resuscitative vitality to the sport. NLU’s founders, all between the ages of 27 and 32, felt the impact of this shift and responded to it. This brings us to one of the most remarkable things about NLU: their social media hasn’t just connected them to other golf fans, it’s connected them to the players, particularly this younger generation of them. And, I should note, the players that NLU connects with aren’t just guys looking for some extra publicity. When I spoke with Soly, he had just posted his interview with four-time major champion and second-ranked golfer in the world, Rory McIlroy. An hour-long interview with perhaps golf’s biggest star, after Tiger Woods. How did he pull that off? Jordan Spieth, Rickie Fowler, and Smilie Kaufman on “Spring Break” in 2016. High probability of a pull hook. The discovery via social media makes sense. But beyond that, young players like Rory understand that in a world of omnipresent media and smothering sports coverage, it’s hard to find a news outlet that wants to have a real conversation. That’s just what NLU is looking for. Soly explained that traditional golf media loves attention grabbing headlines; I discovered this firsthand two weeks ago. NLU did a terrific podcast interview with Soly hosting Jordan Spieth, fourth-ranked player in the world, during which Spieth told a hilarious story about himself, Patrick Reed, and Tiger during the Ryder Cup in October. The morning after the interview was published, I clicked on Golf Digest’s daily email in my inbox and stared at the leading story: “Spieth: Tiger And Reed Trash-Talked Each Other.” Oh boy, I thought. Soly had nailed it; Golf Digest took a single moment from a forty-five minute interview and used it to manufacture a headline that conveyed none of the interview’s context. No sense of conversation whatsoever. I can only imagine how much players abhor that kind of journalism. As Ryan says in the introduction of Slaying the Tiger, “professional golfers are human beings.” It’s an often-overlooked sentiment, but one that NLU dedicates itself to promoting. “It’s been interesting to watch No Laying Up’s progression. You know, they started as these kind of ‘fanalysts,’ but they’ve definitely graduated into real journalists,” said Jack Musgrave. And while the four guys might consider the term “journalist” anathema to the real spirit of NLU, they have undeniably grown beyond typical golf fans since their inception. That’s because when your name is “No Laying Up,” it only leaves you one option. Anything less than the freshest takes on golf would be the equivalent of laying up. Anything less than a real conversation with players, a genuine love for the game, an open dialogue with fans? That’s a layup. Deferring to the “established” golf media? Layup. But that’s a fact that hasn’t seemed to bother them too much up to this point, and why should it? Laying up isn’t an option. NLU Contributor Kevin Jackson is a Sophomore on the Georgetown golf team majoring in Economics and minoring in Journalism. The piece above was written for his fall semester journalism class, and he received an A. Holds NCAA record for most 1-putt bogeys.